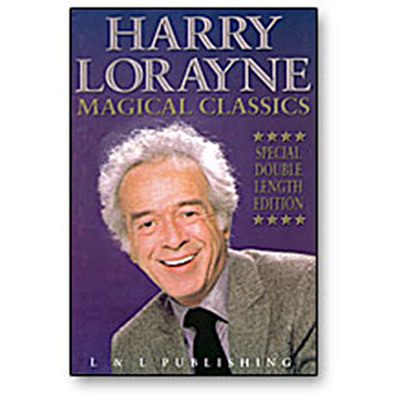 This very special double-length download combines Harry Lorayne's original Stars of Magic video (Harry's first video ever, filmed 15 years ago) with his Magic Video #2 (filmed 12 years ago) to create something we know every close-up magician-amateur or professional, beginner or old-timer-will cherish, and watch over and over again. From his Stars of Magic video, you'll see classics that don't appear on any other video - Amazing Revelation Display, Invisible Pass Routine, Amazing Prediction, Rip-Storation. Also Impromptu Linking Card Routine, Snap!, Lorayne Spread Control, Ultra Move and HaLo Cut. From Harry's Stars of Magic video, you'll see classics which don't appear on any other video - Amazing Revelation Display, Invisible Pass Routine, Amazing Prediction, Rip-Storation. Also Impromptu Linking Card Routine, Snap!, Lorayne Spread Control, Ultra Move and HaLo Cut. From his Magic Video #2 - and appearing nowhere else - you'll see Together At Last, Monte Monte Plus, Silknot, Impossible 2-Card Location, The Ribbon-Spread Palm, King's Highway, Spread Pass Delay, Salt-less, Double Pancake Revelation, Han Ping Chien Finesse, Easy Indicator and The Top-Card Cover Pass. And revisited - The Sting, The Olram Subtlety, The Status Quo Shuffle, The Charlier Shuffle, No Get-Ready Double Lift from Four Cards, The Universal Reversal, Para-Psychology, Secret Subtraction Move, Red/Black Shuffle, 4-Ace Location, To Catch an Ace #5, The Flip-Up Double Lift, The HaLo Cut, Slip Cut to Table and a Double-Lift Finesse. These two videos now combined into over two hours of classic Lorayne!